When you go to Florida every March, as we do, you get a brief preview of summer long before the 80-degree days will appear at home. It’s heavenly to start the day with a walk on the beach. On the last day, Tom and I got one last beach walk in before we left. 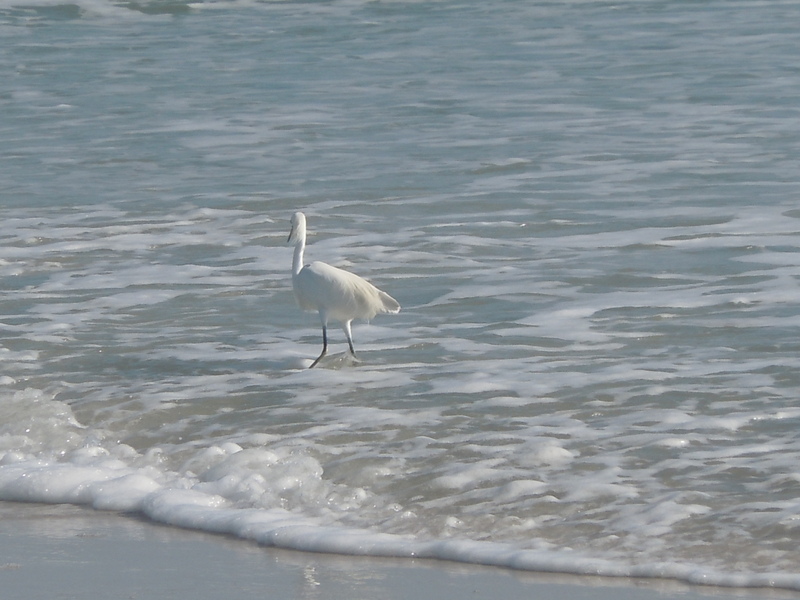 I brought my camera, and took a few last shots of seabirds and surf. Actually, the photo above is from the second-to-last day of vacation. On that last walk, on the last day, I dropped my camera in the ocean. Salt water, it turns out, means instant death for cameras. So now, a week and a wad of cash later, I have a new camera. When packing to head to Florida, I noticed that my summer clothes had all mysteriously shrunk. (It must be that dry air in my closet.) Seeing my pasty white, comfort-food-enhanced body in a bathing suit was a shock, but I have several weeks to get it in shape before the bathing suit has a return engagement here in Wisconsin. Anyway, after a week of trying to squeeze into clothes that had fit just fine last summer, I returned home resolved to eat better. By that I mean adding more veggies, fruit and whole grains, less fats and sugars, and generally aiming for more quality, less quantity. So I inaugurated our healthy eating with a trip to the pantry. Tomatoes are one of the few vegetables (or fruits) that have more available nutrients when cooked. Onions, garlic, peppers, chiles, artichoke hearts, and a secret dash of anchovy paste turned those canned tomatoes into a rich, complex sauce with a definite kick. Simmering chicken in the sauce transferred some of that flavor to the white meat. We loved the breasts this way, but I’d make it again with thighs, or even turkey cutlets. I’ll also try doubling the sauce, then shredding the chicken into the sauce when it’s cooked and serving it over pasta. Cooking the sauce before adding it to the chicken develops the flavors, but if you’re in a time crunch you could brown the chicken and set it aside, cook the fresh veggies in the same pan, then add the remaining ingredients along with the browned chicken and simmer away. A note on the anchovies: If you don’t have a tube of anchovy paste in your pantry or fridge, get one now. Now add a dab of that paste to almost any dish and taste. Anchovies add an umami richness without any of the fishiness you’d expect. And a tube of anchovy paste will last a long time in the refrigerator. We ate that chicken with a gorgeous loaf of bread from my friend Bonni’s restaurant, and some fresh fruit on the side. We loved every bite. Just goes to show you that healthy food can be delicious. Start the sauce: Place a large skillet with a lid over medium-high heat. In 2 tsp. of the oil, sauté the onion, garlic and bell pepper until the veggies are tender and lightly browned. (*If your tomatoes are fresh or plain from a can, add a chile here. I used Rotel diced tomatoes with green chilies, so I skipped the fresh chile. If using hot pepper flakes, add them when you start to cook the onions.) Mash in the anchovy until it’s dissolved. Add the artichoke hearts and cook for another few minutes. Transfer the vegetables to a saucepan. Stir in the tomatoes, wine, basil, and stock. When the sauce comes to a boil, reduce the heat to medium-low and set aside while you prepare the chicken. Grind in some black pepper, give it a taste, and add some salt if the sauce needs it. Heat the remaining 2 tsp. oil in the skillet over medium-high heat. Season the chicken well with salt and pepper. Brown the pieces well on one side; this should take about 5 minutes. Flip the chicken. Pour the sauce around and over the pieces. Cover the skillet, reduce heat to medium-low, and cook for 20-30 minutes until the chicken is cooked through and very tender. Garnish with fresh parsley and serve hot. 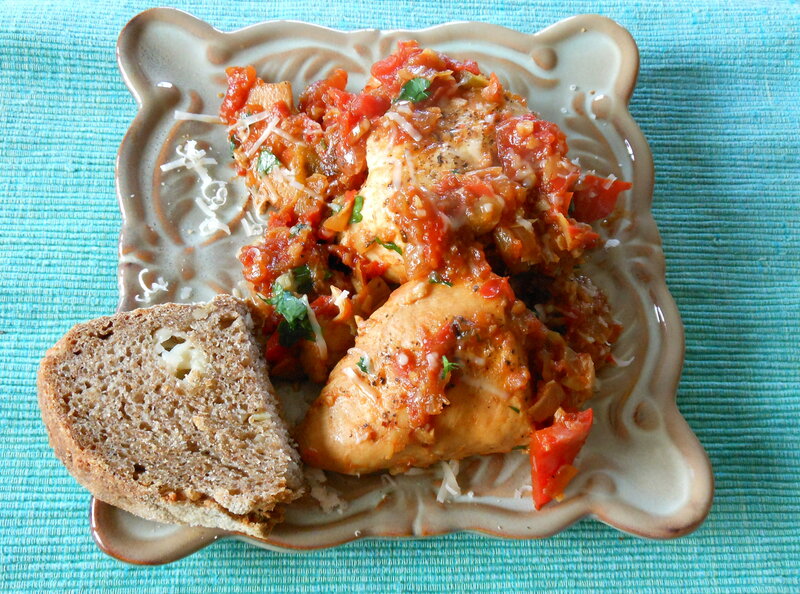 This entry was posted in main courses, meat, poultry,and fish and tagged artichoke hearts, artichokes, bell peppers, boneless skinless chicken, chicken, chicken breasts, chiles, peppers, spicy, tomato sauce, tomatoes. Bookmark the permalink. If only one of us weren’t allergic to fish. I’d love to try the anchovy paste. I still remember the Best Pizza in the World at Santarpio’s in East Boston: garlic/anchovy. You just couldn’t BELIEVE anything could be so delicious!